Sometimes, when teaching in a foreign county, you have to fudge the details a little bit. I'm in the middle of English summer camp at the moment. Today was "cooking day." At the request of Coteacher, I had to come up with something "western" for the kids to "cook" that didn't require cooking equipment or expensive western ingredients. My first instinct was to make sandwiches, but deli meat is nonexistent. I gave Coteacher PB&J as an option, but she said peanut butter was too expensive (nut allergies seem to be less of an issue here). 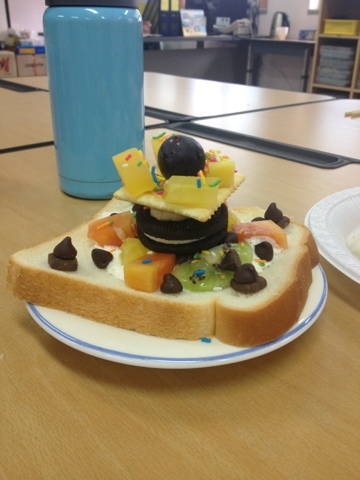 So I thought fine, lets just have them pile a bunch of random stuff on top of bread. 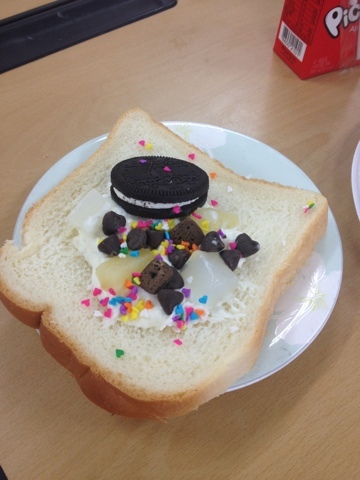 Behold, the invention of "bread cake." Some of the students got very artistic with it. 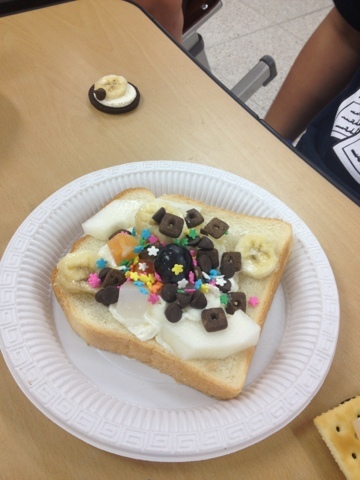 At the end of the lesson, I had convinced them (and my Coteacher) that "bread cake" was a staple of the American diet. I might be going to ESL teacher hell.